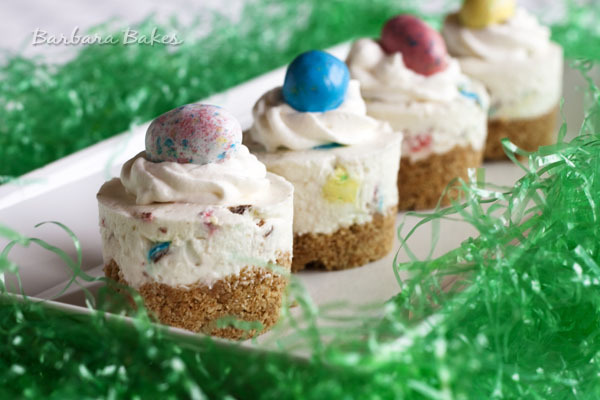 Looking for a fun dessert to serve for Easter? 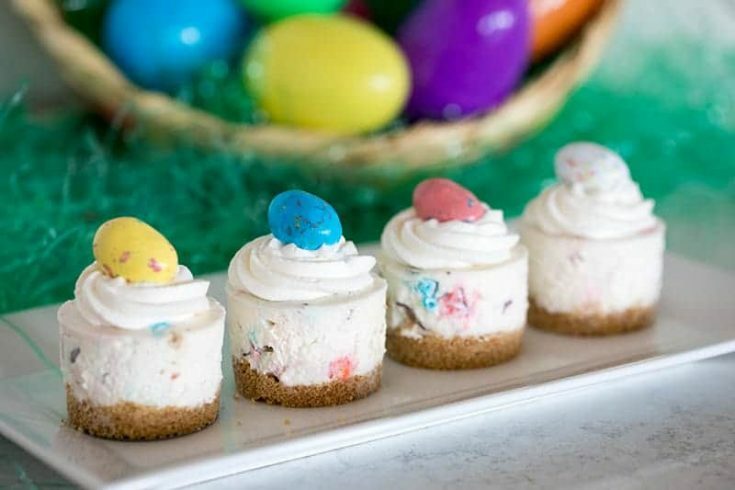 These mini cheesecakes are easy to make, adorable and taste as good as they look. My Robin Eggs Cheesecake were inspired by Bakers Royale’s Oreo Cookies and Cream No-Bake Cheesecake. Instead of using Oreo cookies, I used colorful malted milk ball Robin Eggs only available at Easter time. The malted milk ball taste is subtle. My daughter isn’t a fan of the Robin Eggs candies, but she loves this cheesecake. I love the Whoppers Robin Eggs, but I’m sure these would be great with your favorite chocolate Easter candies too. I made them in a fun mini cheesecake pan, but if you don’t have a mini cheesecake pan, you could buy 6 mini, recipe-ready Graham Cracker Pie Crusts, or 6 custard cups. Combine crushed graham crackers and butter in small bowl. Spoon a heaping tablespoon of the crumbs into each cup of a mini cheesecake pan. With fingers or round end of a wooden spoon, press crust down evenly. Gently fold in Robin Eggs. Refrigerate for at least 6 hours to set or overnight for best results. Serve with a dollop of whipping cream and garnish with a Whopper. *Don't chop in a food processor. You want larger pieces than you'll get in a food processor. Hi Jesika – yes, you can double the recipe with no problem. It might be easier to mix the Robin eggs in if you use a big bowl so the color of the eggs doesn’t mix in too the batter too much. 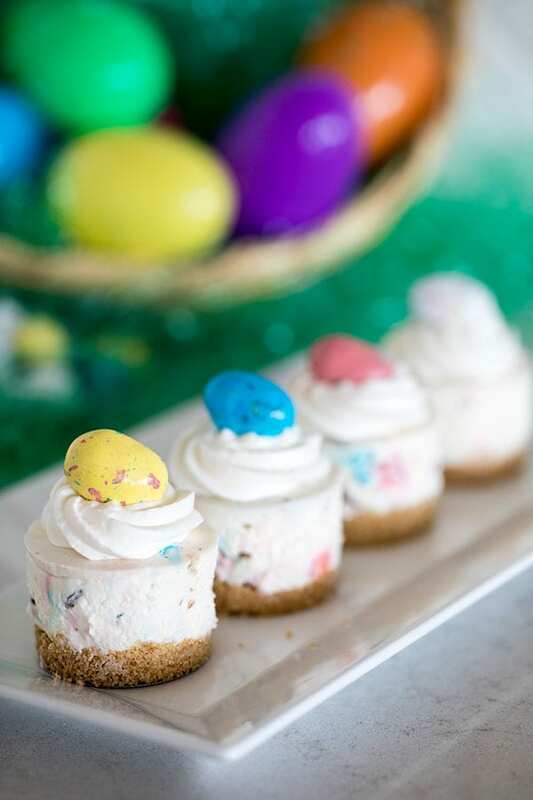 My kids love these cheesecakes very much, They love colorful eggs on the top of them. nice to have individual serving sizes and no bake, will have enough going on in oven anyway, also good tip about not using a food processor on the chocolates, thank you for this! What a delicious idea!! Can’t wait to try these for my family on Easter- thanks Barb! How cute are these?? Perfect for Easter. I love this idea. Looks simple and delicious at a low cost, too. But, I have a confusion on instruction number 4. “Fold in Whoppers”? What does that mean exactly? Thanks Sam – they really are a great dessert. Whoppers are the brand of Robins Eggs. I changed the directions to avoid the confusion. Pingback: 10 Easter Desserts that will become Traditions!